Wood is the traditional gift for fifth wedding anniversaries and, apparently, first Mother’s Days. 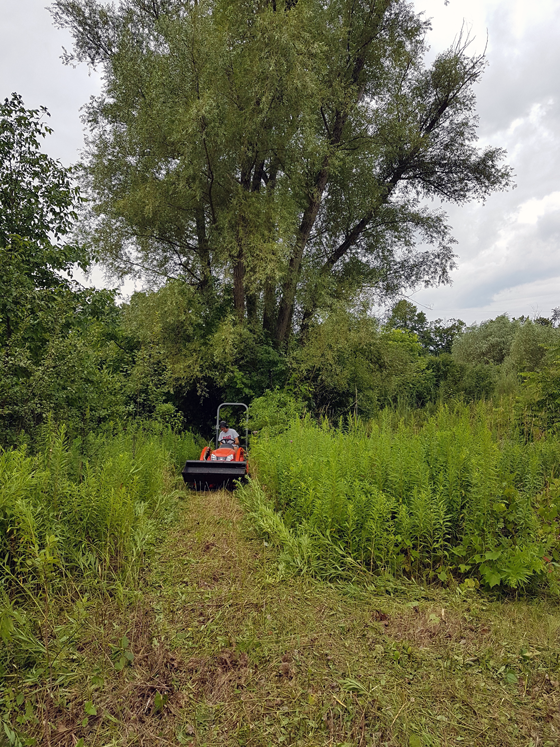 Last Sunday, Matt and his Dad spent hours working to clear the trails in our back woods. 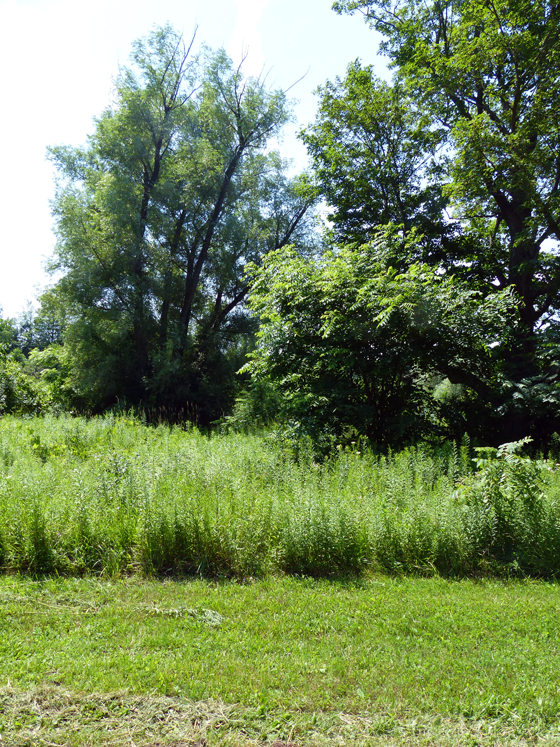 I love walking the trails on our own property, but I’ve written before about how they’re a bit overgrown. An ice storm and wind storm this spring made the trails nearly impassable. For my walks with Ellie and Baxter, this situation was far from ideal. Imagine if you will a woman walking in the woods. 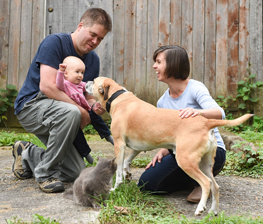 She is wearing a baby in a carrier on her chest and she has a dog leashed around her waist. They come to a stream crossing. The catwalk has washed out and a tree limb has fallen, blocking the trail. She forges ahead, contorting herself to slither around the tree without dumping the baby out of the carrier and into the water. 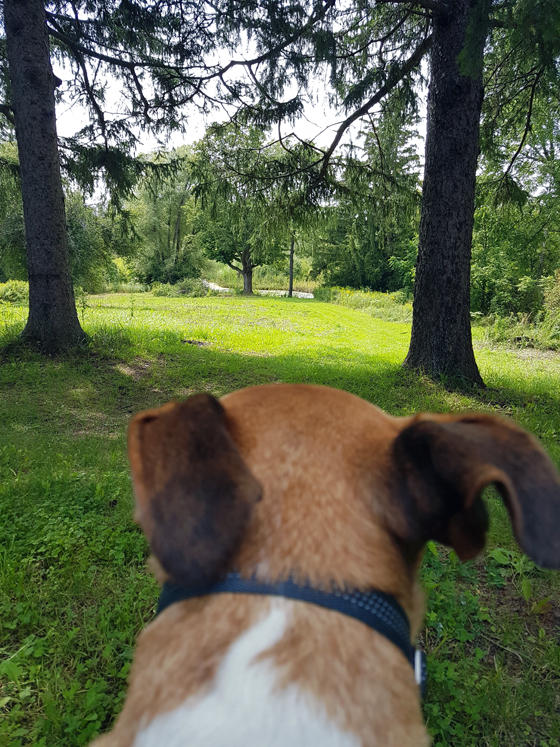 The dog chooses a different route and the leash ends up wrapped around various trees. The woman temporarily loses her balance and adjusts her footing–right into a deep part of the stream. Her boot fills with water. 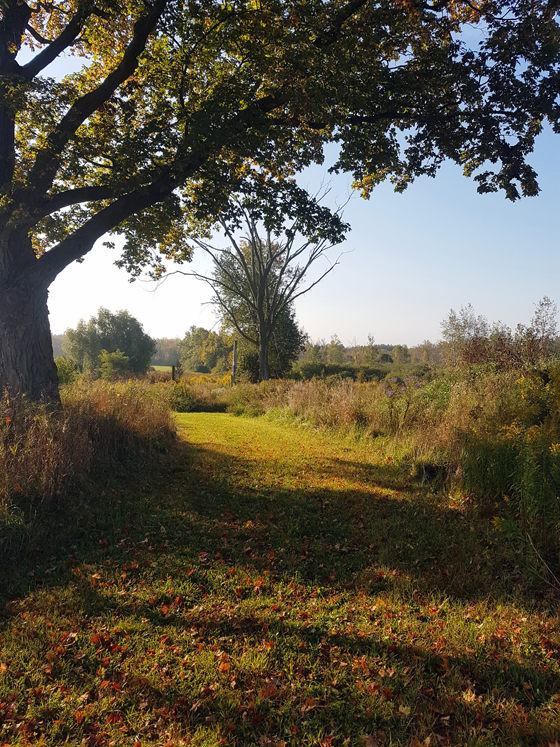 After emptying out my boot, wringing out my sock and untangling Baxter–all while still balancing Ellie in the carrier–I decided the trails were out of bounds until we did some work. 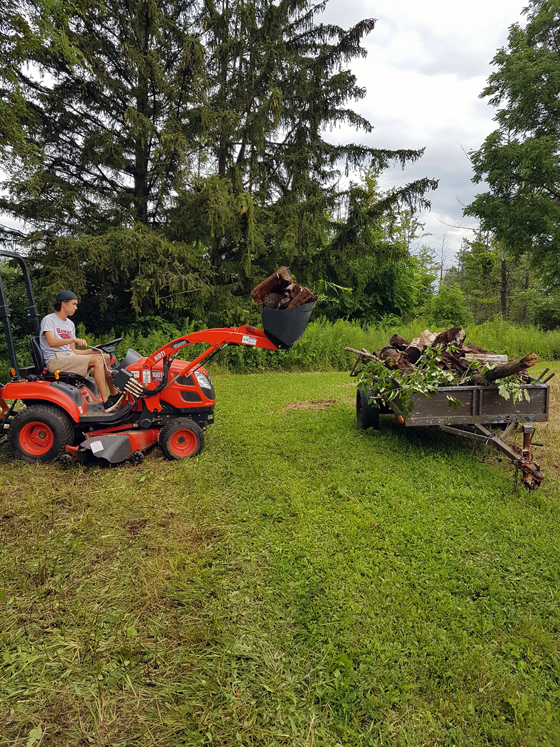 So I was thrilled to receive a Mother’s Day present involving chainsaws, wheelbarrows, multiple loads of firewood and clear(er) passage on the trails. You may recall that Matt and I had done this chore previously, so I know exactly how much work this was. I’m over the moon happy to have access to our trails and incredibly grateful for Matt and his Dad working so hard. I’m also still holding out for a brigade of forest rangers equipped with ATVs, wood chippers, weed whackers and chainsaws (these trails could seriously use a whole season of work from a whole crew). Perhaps next Mother’s Day? Ellie and Matt assembling our new wheelbarrow. Ellie, Baxter and I helpfully supervising on Mother’s Day. One of my rituals every spring is walking around the property to see what plants survived the winter. 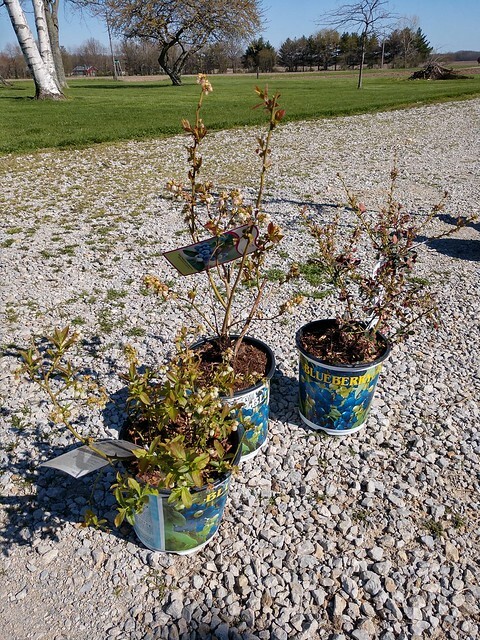 It’s always a win to see buds, leaves and blossoms appearing on bushes and trees–particularly the young ones. Sarah has been doing the same at her home in Illinois. She’s sharing her wins, losses and new additions in her post today. Spring! It’s finally here. This honestly felt like the longest winter we have ever had. As soon as the weather was warm enough to work outside, Steve and I jumped in on several of the projects that we have been waiting patiently to tackle. Last year you might remember that we planted some fruit trees. This year we noticed that the cherry tree didn’t make it through the winter. 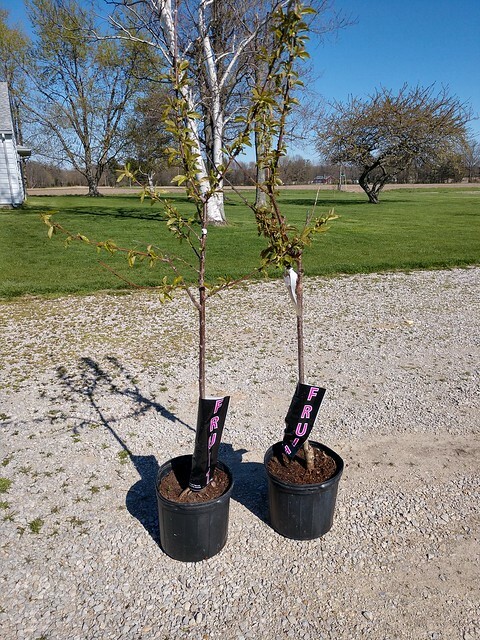 I knew that I needed to add another tree anyway for them to bear fruit, so Steve and I picked up a couple new sweet cherry trees. 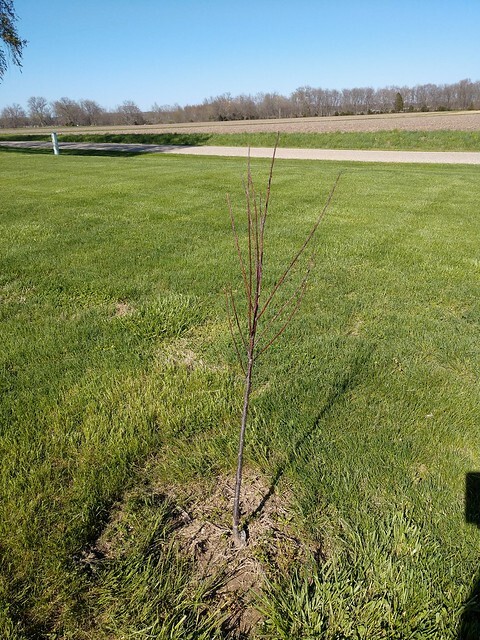 The other trees that we planted last year look like they are doing okay. 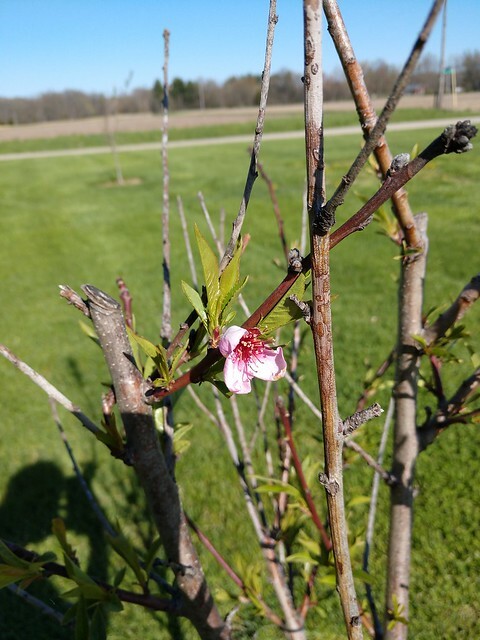 The peach tree even started to bloom. Unfortunately none of my blueberry bushes made it through the winter. I wasn’t too surprised however because they really didn’t look very good last fall. I had purchased bare root blueberries last year, and I just don’t think I have very good luck with bare root plants. So this year we bought nice healthy bushes. I feel like these have a much better chance of making it. I am watering them faithfully. Remember the watering rule that my mom taught me? Water every day for a week, every week for a month and every month for a year. Things are becoming very busy around here and I love it. This is the best time of year. What is the weather like where you are? Do you have any fruit trees? Do you have any luck with bare root plants? Mmmmm… you have me thinking ahead to summer fruit, Sarah. 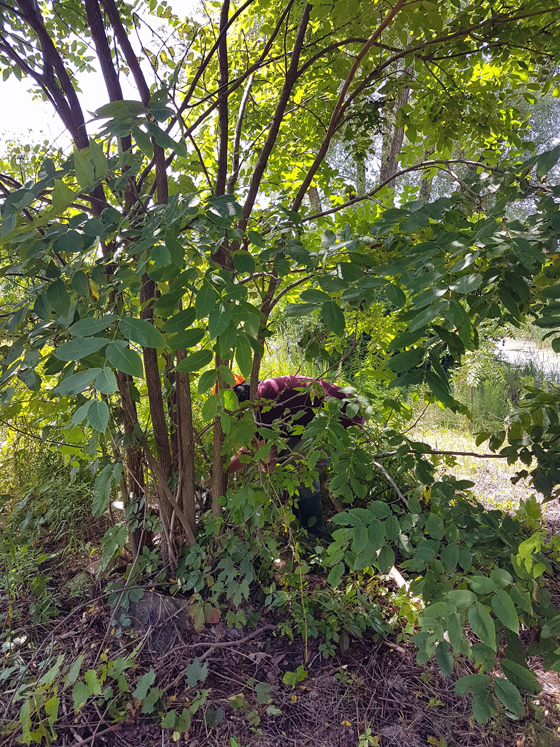 I added blueberry bushes last year as well. They were not bare root, but they too were not looking super spunky by the end of the season. This spring has taken so long to arrive that I’m still at the fingers crossed stage for our grapes, blueberries and blackberries. I’m really hoping I see buds soon. 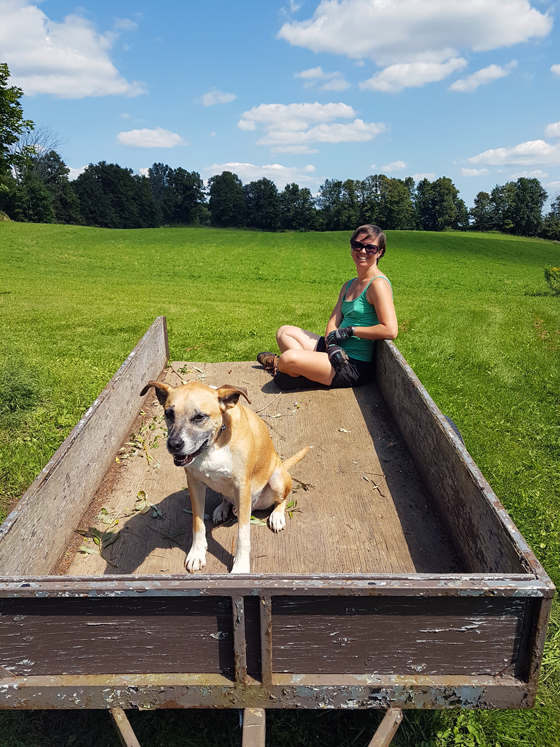 While our gardens may be buried in snow–and after freezing rain yesterday, ice–many of us are still planning, dreaming and thinking about what we’ll be growing this coming season (see Sarah in Illinois’ plans that she shared last week). I recently wrote an article for The Canadian Organic Grower, sharing some tips for growing fruit in cold climates. As hard as the snow, cold, ice and wind can be on humans, the climate can be equally harsh for plants. Despite the challenges, many Canadian gardeners want to grow and enjoy fresh tender fruit right in their own backyards. 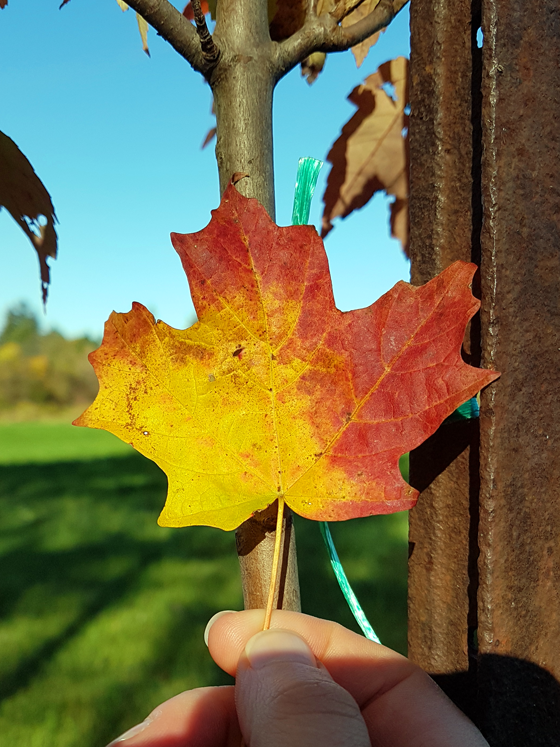 Fortunately, a growing number of nurseries, breeders and researchers are cultivating trees, vines and bushes that can thrive in Canada. In our own garden, I am excited by the prospect of hopefully picking our first crop of grapes this year and seeing our blueberries and blackberries return. These fruits are all cold hardy varieties that I specifically selected to ensure they survive (and hopefully thrive) at our farm. For my fellow cold climate dwellers, do you have any recommendations of particular varieties that you grow at your garden? Or tips to help plants survive cold weather? What climate and growing challenges do you face in your garden? Late fall sunset over the pond. Let’s go back in time. Waaaaay back to my second month of blogging and my 20th post ever. 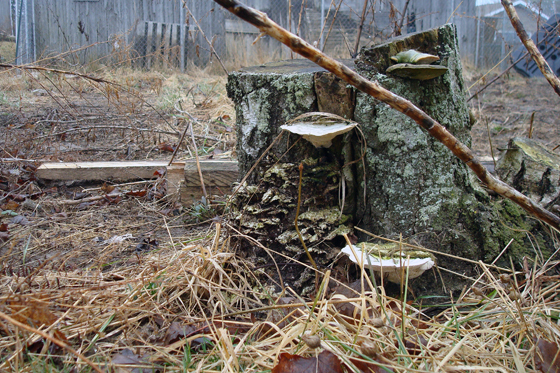 On a foggy spring morning, I snapped a photo of this old stump covered in moss and mushrooms. 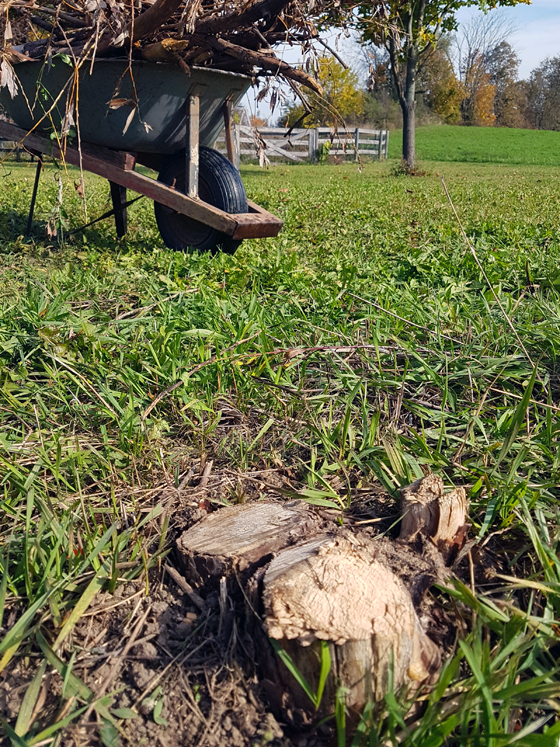 While I certainly appreciated the natural beauty of the stump, I didn’t appreciate its location in the middle of the “yard” (can’t really call it a lawn back then) between the driveshed and the garden. My strategy was to make the stump into our firepit. That was in spring of 2013. Now, in the fall of 2017, I can finally stay the stump is officially gone. 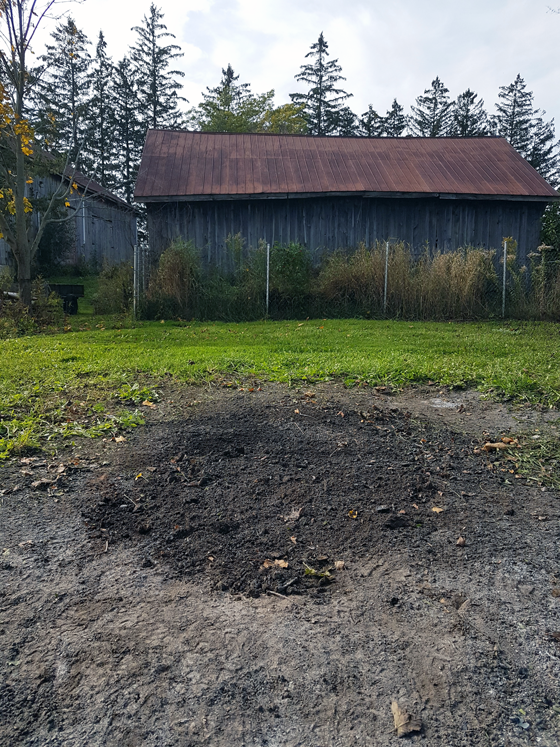 On the weekend, I shoveled up two years worth of ash (I’ve done this cleanout once before) and leveled the ground. 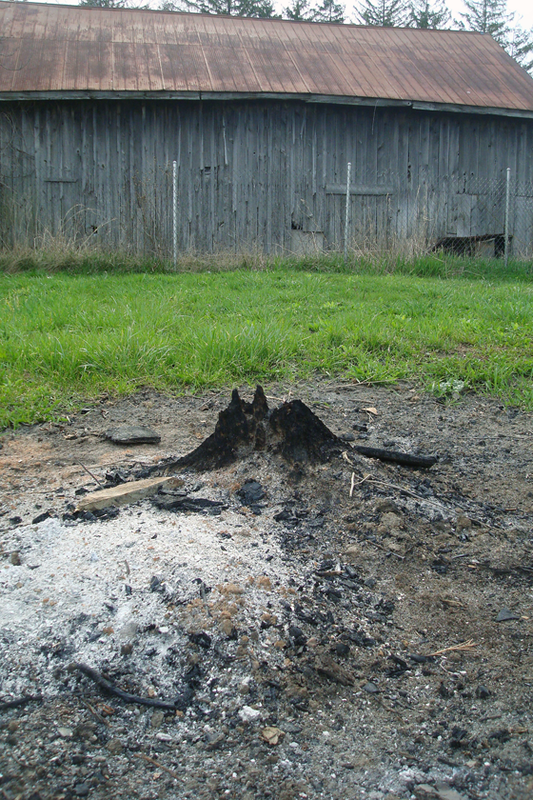 Surprisingly, remnants of the stump were still there. It was very squishy and rotten, so I easily hacked it down with my shovel (here’s how I keep my shovels sharp). Then I raked everything level. After Matt hit another stump with the mower over the weekend, we have a new candidate for the next firepit. 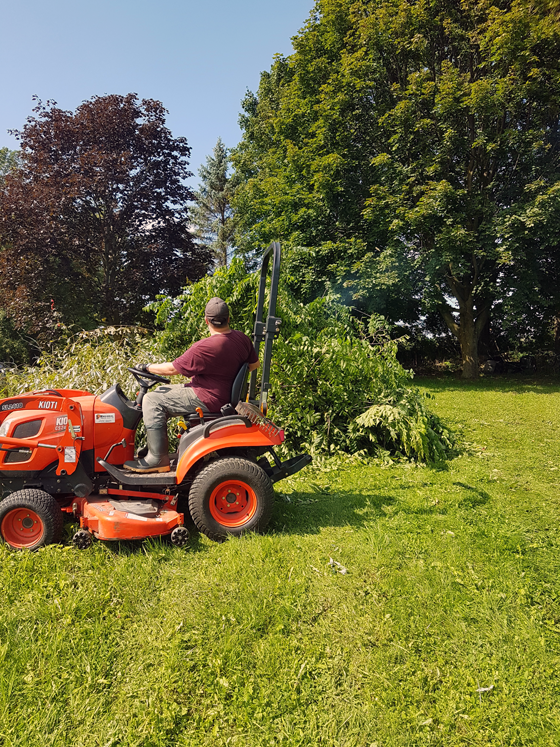 We also happen to have no shortage of brush and deadfall, so stump removal 2.0 is now underway. Tree maintenance is ongoing at the farm. Do you have a firepit at your house? 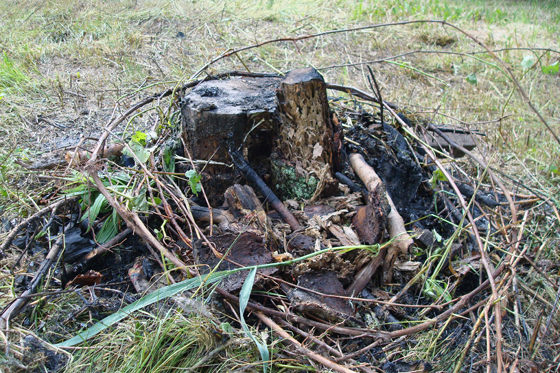 Have you ever burnt a stump? Any techniques or advice for removing stumps? Three and a half years ago, we got four maple saplings from Lowes. They were free and part of a giveaway in response to the ice storm we’d been through the previous Christmas. Three of the trees have survived, but interestingly they’re growing very differently. We planted most of the trees alongside the driveway to further my ambition of having beautiful big branches arching over the driveway some day. One of these trees is the one that died. We planted the final tree on the turnaround. We already have a huge old maple that I love on the turnaround. But I’m worried that some day it may come to the end of its life, and I’d like to have a new tree established at that time. The trees were all very, very small when we got them from Lowes, but they were all roughly the same size. For some reason, the tree on the turnaround is growing big and fat, while the two on the driveway are still fairly spindly. 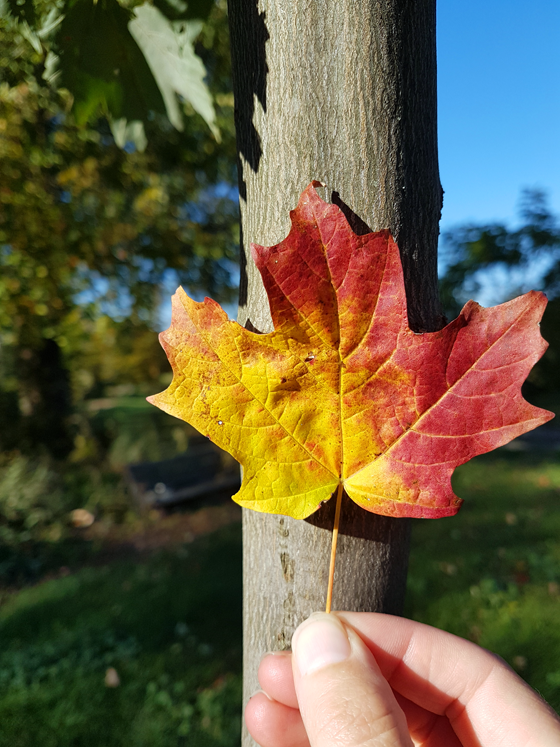 Observe the one on the turnaround–with a handy maple leaf for scale. And now let’s walk down the driveway with our same measuring leaf. Does it seem weird to anyone else that these trees are so different? 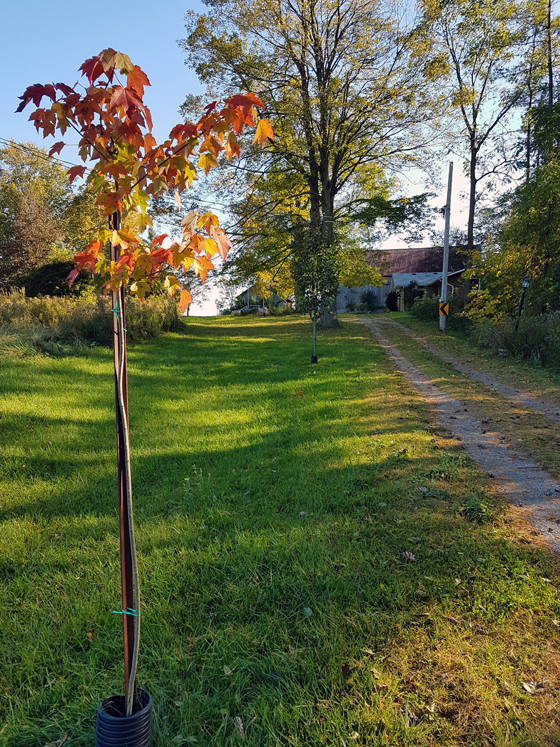 They’re supposed to be the same type of trees (red maples), planted at the same time on the same property and cared for neglected in the same way. As I’m writing this, I’m looking out the window at the turnaround, and I’m wondering if this tree is different from the others. You can see in the photo at the start of this post that the driveway tree sports a crown of beautiful red leaves. The turnaround tree–which has many, many more leaves and branches–is still completely green. Hmmm. That would certainly explain why it’s growing differently. Any other ideas? Any tips for tree care? I admit, my usual approach is to do nothing. Summer is hanging on, with hot temperatures and bright sunny days. But leaves are starting to turn and the trees are showing their colours. And officially on the calendar, fall is here. Since moving to the farm, I’ve discovered a few new favourite tools. One of these is the chainsaw. However, in our house the chainsaw is Matt’s and he’s the one who wields it. Due first to Matt’s broken arm and then to a hole in the oil tank on the saw, we’ve been chainsaw-less so far this year. Matt’s arm is healed and almost back to full strength. He and his Dad fibreglassed the oil tank back together. And over the weekend he finally fired up the saw. 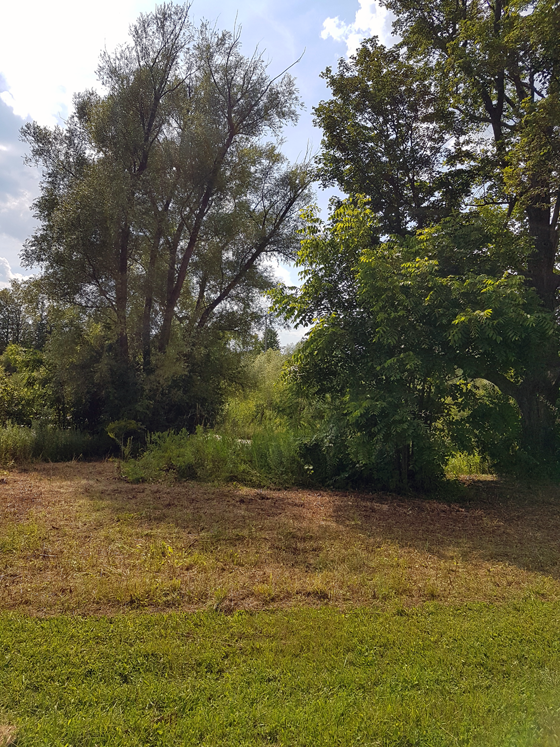 Low hanging branches, small trees that sprouted up in unwanted spots, dead wood have all been trimmed. Best of all, Matt went through the meadow and down to the pond. My view to the pond is continuing to clear. 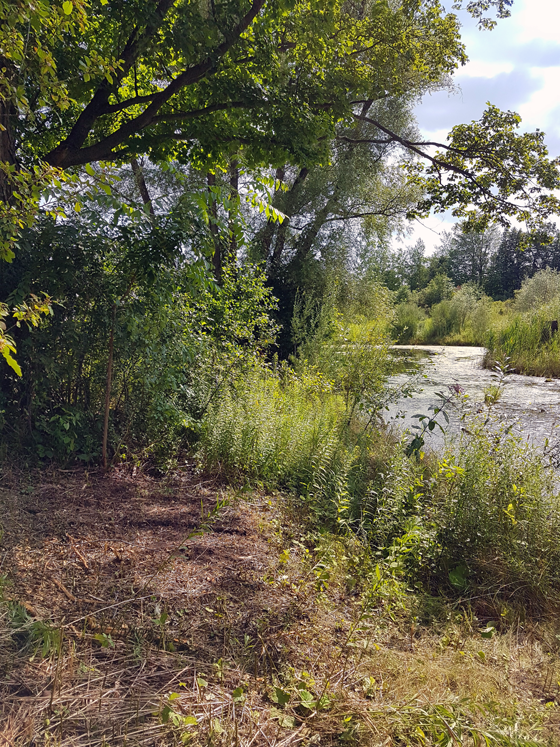 It seems like as soon as I abandoned hope of clearing the pond shore this year, that’s when we finally started this project. 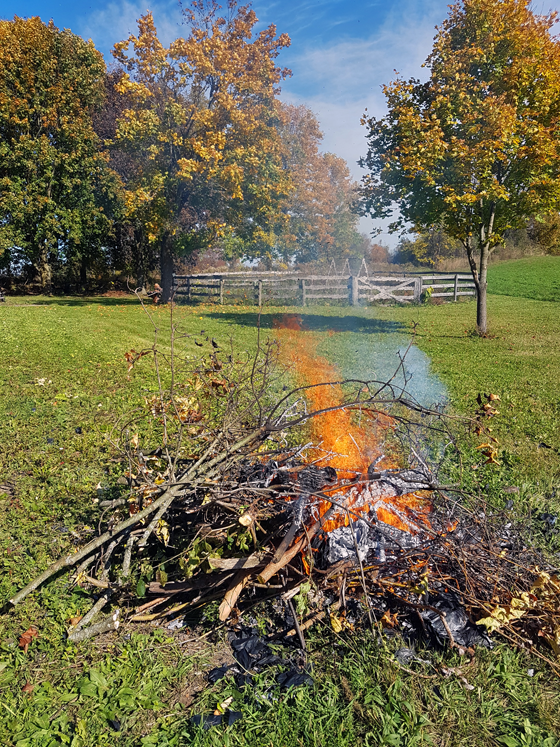 A few hours of work netted us the biggest burn/brush pile I think we’ve ever had. A tractor-size one. 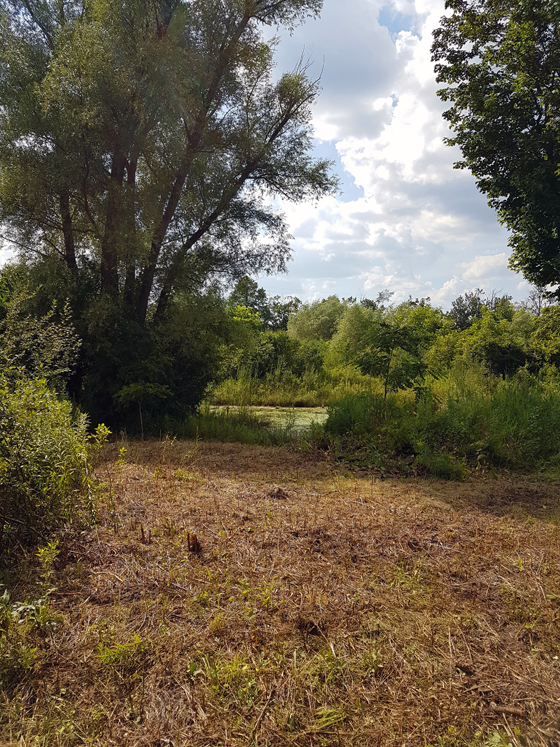 We also left a bunch of brush down at the pond to burn there. Collecting the brush was Mr. B’s favourite part. Or the trailer ride to get the brush was. Remember how clearing the pond shore was my one and only outdoor home goal for this year? And how at the mid-year report I said it wasn’t going to happen? 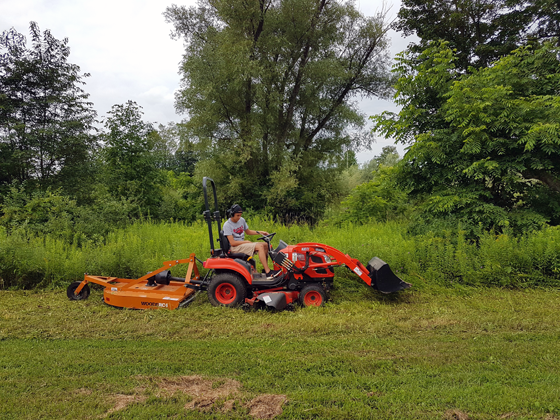 Our keen 17-year-old nephew who loves being at the farm had a day off from his summer job, and he wanted to learn how to drive the tractor. If you’re driving the tractor, you might as well learn how to use the front end loader, the new rotary cutter and tow the trailer. So I went through the basics of a hydrostatic transmission and what levers did what. We hooked on the rotary cutter and I pointed him at the pond. 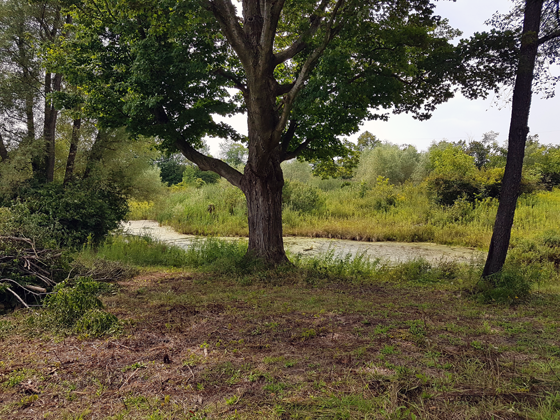 Here’s how things were looking after last weekend’s mowing of the meadow. I swear there’s water on the other side of all of that grass and brush. I was super impressed with our nephew. He was calm and confident and careful. A morning of work cleared about half the shore on the east side. The remaining thickets are hiding all kinds of logs and stumps. So we have more work to do, and I need to set Matt loose with his chainsaw, but the progress is awesome. This vantage point still doesn’t show you much of the water, but I swear it’s there. 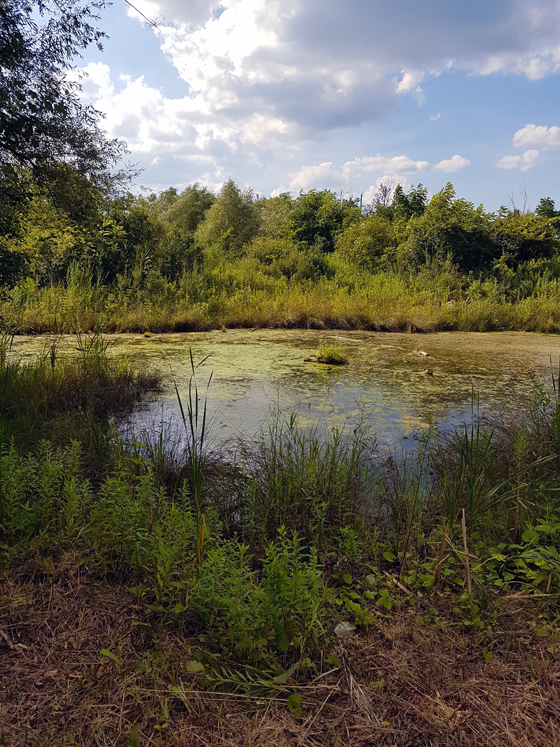 This deep in the summer, the pond is a little mucky, but it’s still my favourite part on the property. Our nephew totally made my summer. A big ancient apple tree stands right in the middle of the meadow. Now that we’ve mowed some of the grass, I can actually get to the tree to see that it’s loaded with little green apples. 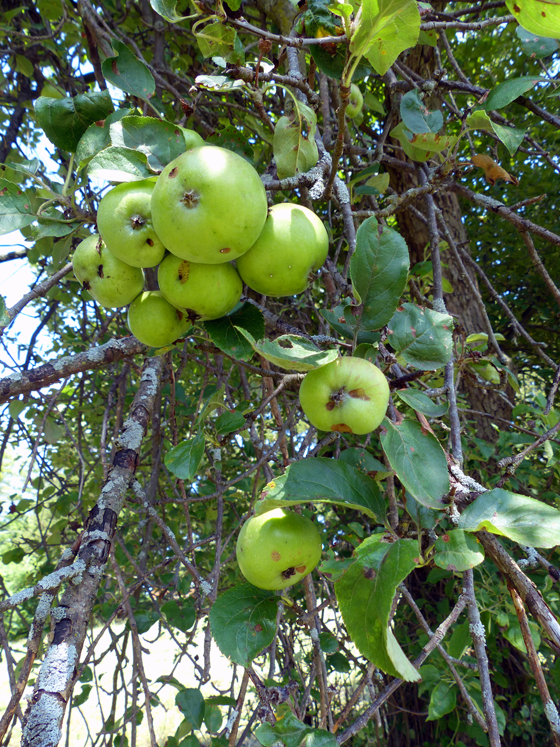 We have apple trees sprinkled around the farm, but we’ve never done anything with the fruit. Maybe now that this one tree is accessible this will be the year. My friend made an amazing apple butter for us last year that Matt went bananas (does that even make sense?) for. Plus, apple sauces and butters and jellies don’t care how pretty (or, let’s be honest, not) our apples are. And these are pretty homegrown looking. Although I don’t think I can take any credit. This tree has been doing very well all on its own. Do you have any apple trees at your house? Any tree care tips to share? What about favourite recipes?